Are the vibrant flowering plants that were attracting butterflies, bees, other insects, and birds to your garden looking a bit faded? You may itch to start cleaning out dead, drying vegetation to prepare for winter. Stop! Many critters will benefit from these plant remains, especially the birds—and many birds and other pollinators are in our gardens year-round. You’ve likely heard of the need for plants that attract and feed honey bees and Monarch butterflies. Bee decline threatens the insect pollination of critical food crops. Monarch butterflies and their migration patterns are an awesome and beautiful natural event. Loss of habitats and overly aggressive use of insecticides and herbicides are culprits in honey bees and Monarch butterflies’ misfortunes. But there are thousands of other bee and butterfly species— not to mention other insects and birds—that depend on pollen plants for their existence. What to include in your garden? Planting Monarch- or honey bee-friendly annuals and perennials that bloom mostly in the summer may not be enough to assist other important pollen-needing critters. Bees of all kinds love the flowers (pollen) of many other beautiful landscape plants. And birds flourish where insects are abundant. 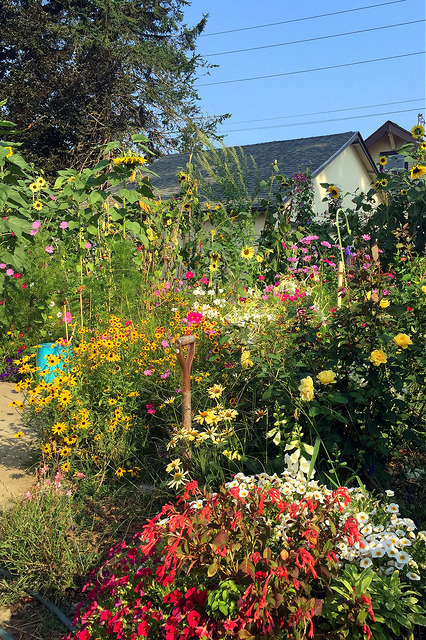 Consider a year-round approach to pollinator-attracting garden plantings! As summer annuals and perennials fade, autumn-flowerers begin to show off. Cardinal flowers (Lobelia cardinalis) and goldenrods (Solidago spp.) are just starting to display their colors. Asters and sunflowers (many species of both) are among many other fall-blooming plants to consider adding to your garden. Fall is also a good time to plan for pollen plants year-round. Considering adding trees to your landscape, both large and small, that will provide food sources as the garden emerges next spring. Fall and winter planting of trees will get a start on a long-term food source for insects and, subsequently, birds. In Western North Carolina, we are surrounded by beautiful deciduous hardwood forests. Birds are particularly dependent on the insect populations that make their homes in trees. In his book, Bringing Nature Home (Portland, OR: Timber Press, 2014) researcher Douglas Tallamy estimates that as many as 400 different insects live off oak trees—creating a feast for birds. Maples, oaks, and yellow poplars are among the first producers of pollen in early spring. Smaller understory shrubs and trees— holly, redbud, serviceberry, dogwood and sourwood—follow soon, blooming in April and May. The pollen these trees produce attracts emerging insects. Overwintering and migrating birds eat many of these insects. Weather alert! If heat continues and rainfall tapers off (as it usually does in the fall months), be sure to water to extend the blooming season and keep your new plantings thriving. Although your garden may seem to have come to a standstill, your plantings are increasing root mass all winter. Although most insects are dormant, birds are busy consuming seed from trees, shrubs, and herbaceous plants. Meanwhile, Monarchs are vacationing in Mexico! Everything is awakening. In addition to the early blooming trees and the beautiful flowering understory trees, make sure your landscape includes spring ephemerals. Some you can purchase at nurseries include bloodroot (Sanguinaria canadensis), trilliums (Trillium spp. ), and wild ginger (Asarum canadense). Also, as your lawn comes to life, recognize that treating for weeds and insects can damage pollinator insects’ habitat and health. The summer season gives the best show. Milkweeds provide nectar for many butterfly species and larval food for the Monarchs. Bees, butterflies, and other insects cover bee balm (Monarda spp.) flowers. Many ornamental annuals and perennials are good nectar and pollen sources, as well. So, in every season gardeners who work to increase and protect the plants that support insects are pollinating insects’ and birds’ best friends! Note: Master GardenerSM volunteers of Buncombe County encourage you to visit “The Learning Garden” at the Cooperative Extension office, 49 Mt. Carmel Road, Asheville, where you will see examples of year-round pollinator-attracting gardens. Article written by James C. Wade, Extension Master GardenerSM Volunteer.